TurksandCaicos, October 30, 2017 – Providenciales – A monumental gift arrived on board the Kristina cargo ship direct from Port Au Prince, Haiti loaded with a generous contribution from the Haitian Government to the Turks and Caicos Islands in the aftermath of deadly hurricanes Irma and Maria. 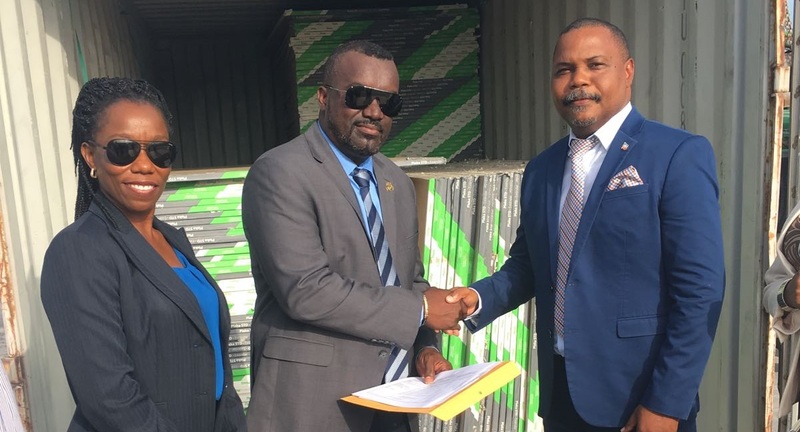 This is the first official gift from the Government of nearby Haiti and the items were handed over to Minister of Home Affairs, Hon Delroy Williams and DDME director, Dr. Virginia Clerveaux on Monday by Haiti’s Consul to the TCI, His Excellency Jacques Adolphe. Usually Haiti is on the receiving end of the gifts during a storm season, and while we are still 31 days from the end of the 2017 Atlantic Hurricane Season, Consul Adolphe explained that Haiti is counting its blessings that no catastrophe has come its way via hurricane this year, so far. The supplies include: 630 generators, 1000 sheets of plywood, 4,500 tarps, 2,000 sheet rock and 4,000 metal roof sheets which were presented to TCIG. It was explained to #MagneticMedia that the items were donated and TCIG alone will oversee and determine the distribution of the supplies. There have been other donations shipped to TCI from Haiti since the back to back September storms.